Place the pitted dates in the bowl of a blender and add in the water. Blend until smooth and creamy, adding more water if needed. If your dates are nice and moist you may not need to add more water. Transfer date mixture to a small saucepan. Add the maple syrup, coconut oil, vanilla and salt to the date mixture and whisk to combine. Continue to whisk over medium low heat 5 to 7 minutes. Mixture should be completely smooth. Transfer to a glass container, set aside and allow to cool to room temperature. Mixture will thicken as it cools. Core the apples and thinly slice them using a mandoline or sharp knife. Place slices on a large platter or plate and squeeze the lemon over the apples to prevent browning. Melt the chocolate chips in a small saucepan over medium low heat, stirring as it melts. Place a plastic resealable sandwich bag over a small glass, pour the melted chocolate in bag and zip the bag, repeat with the cooled vegan caramel sauce.Cut a very small tip from one of the bottom corners of each bag. 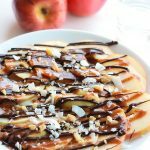 Arrange apples on serving platter, drizzle caramel and chocolate sauce over the apples and sprinkle with walnuts and coconut.